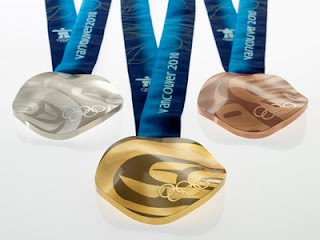 As a follow-up to our previous posting regarding Picabo Street, Needtovent is pleased to reveal the unique design for the 2010 Vancouver Winter Olympics Gold, Silver and Bronze Medals. Organizers proudly declare that these medals "each feature a different crop of larger contemporary Aboriginal artworks and are undulating rather than flat -- both firsts in Games history. The dramatic form of the Vancouver 2010 medals is inspired by the ocean waves, drifting snow and mountainous landscape found in the Games region and throughout Canada." Has the word "undulating" ever been used in a sports-related press release before? We think not. Topography aside, we can not help but agree with Ron Judd, columnist at the Seattle Times, who described the medals as "displaying the traditional native 45RPM-record-left-on-dashboard-in-sun design." also heard they were supposed to be made of recycled materials....can you confirm? Wonderful design, truly motivating, I'd like to have one of them! No, I'm serious, it's original, innovative, and not at all cliché. Anyway, it's the sport itself that matters the most, isn't it?